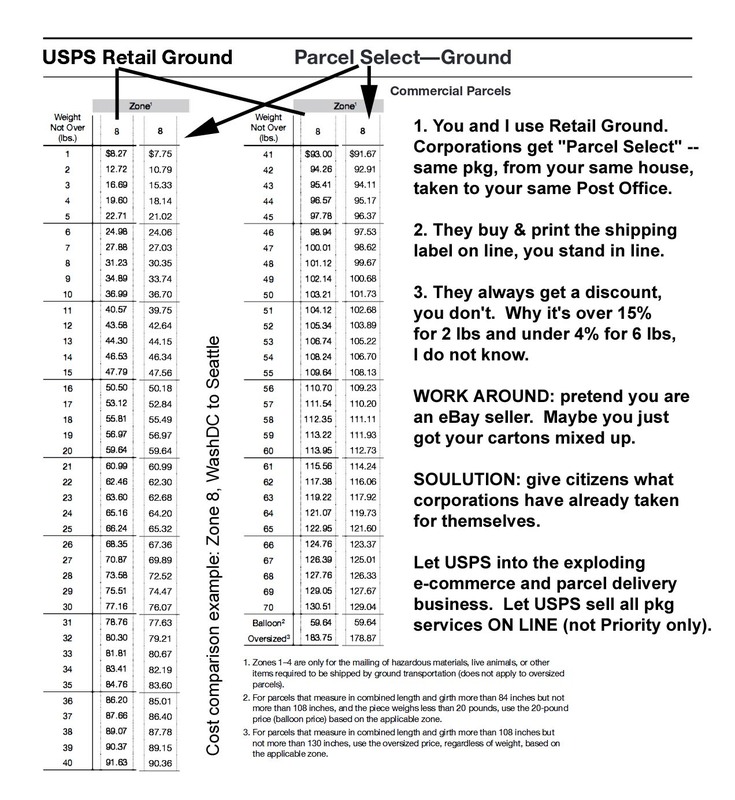 The ability to by parcel post shipping labels online ended April 2011. Now (2018) you can get (and pay for) shipping labels online only for Priority mail, and there is no discount. eBay wants to collect sellers' fees and selling means shipping, so eBay customers can buy all the important domestic shipping services online through PayPal, which eBay once owned and which is still under contract to eBay. Here are the prices -- not to mention the online payment convenience and label printing -- they get vs. the ones we have to go to the post office to pay, using the example of a carton going coast to coast and Jan 2018 prices. The U.S. Postal Service itself should offer all domestic package services online to all US citizens because the USPS needs the revenue . . . and we're all entitled to it anyway. Corporate control of government functions, and government policies bent to serve the purposes and profitability of corporations, is called fascism. This may be only a teentsy weentsy example of it, by why go this direction at all? The Founding Fathers gave us postal service in the first place. Honor them.